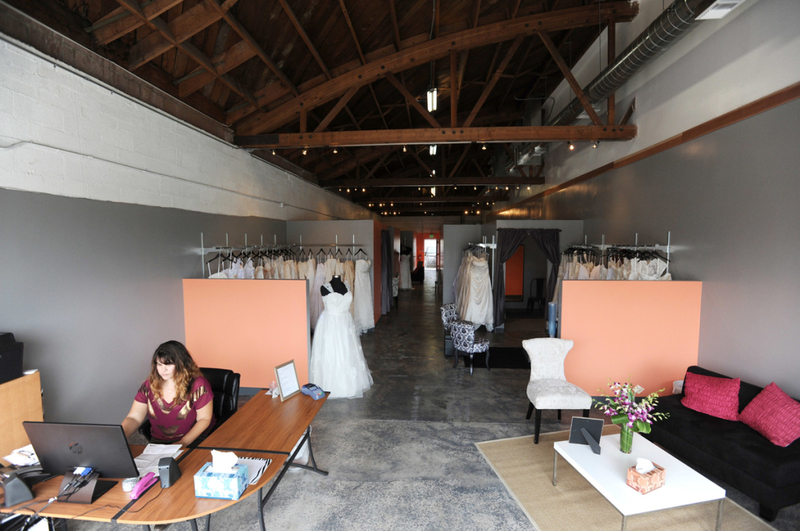 Our Los Angeles-area bridal store for curvy and plus size brides is located in Bixby Knolls, a beautiful neighborhood located just off the 405 in Long Beach. We chose Bixby Knolls because it is conveniently located between Los Angeles and Orange County, and easy to get to from the Inland Empire. You’ll love the quaint, walkable street with independent shops and restaurants. Make a day of wedding dress shopping and explore our whole neighborhood! You can reach us via phone at 562.612.1884, or via email at service(at)strutbridalsalon.com. There is free 2-hour parking on the street in front us. We have limited parking behind the building with one handicapped spot–please call to be let in our back door. While appointments aren’t required, we do recommend them so you can enjoy our award-winning, expert, one on one service. Our brides tell us they love our funky, non-traditional store with original truss and bow ceiling. Our store features private fitting rooms,expert stylists, and the largest selection of wedding gowns in the Los Angeles area that curvy and plus size brides can actually try on. We really look forward to helping you look and feel amazing on your wedding day!